Welcome to Eat Mexico’s Frequently Asked Questions page. If you have a question and you don’t see it below, please email us at hola@eatmexico.com and we’ll respond as soon as possible. Thank you! Am I going to get sick from eating Mexican street food or tacos? The true answer is: we don’t know. We love and enjoy this food, but we don’t know you personally. Mild discomfort is typical for people who aren’t used to eating Mexican spices or produce, or for those whose stomachs react to particularly acidic, spicy, salty or heavy items. Our tours also contain a lot of food—around six different items eaten in four hours—and some contain raw, peeled fruits. These foods can affect people in different ways. The best rule of thumb, if you’re new to eating Mexican street food or produce, is to go slow and know your body and your limits. That said, we’ve been in business since 2010, visiting mostly the same set of vendors. We’ve served thousands of happy customers. We have hundreds of five-star reviews on TripAdvisor. Our guides and staff take the food quality and cleanliness on our tours extremely seriously, and we personally eat the foods at each stop, hundreds of times a year. The stands we visit are not fly-by-night operations. Most of them have been in business for more than a decade and their owners depend on them to survive. Any Mexico City resident will tell you that food poisoning can come from anywhere, including high-end restaurants. However, if you are extremely worried about getting sick, or your stomach cannot tolerate a wide variety of foods in one sitting, this may not be the right tour for you. For more details, please read our Terms & Conditions page. How do I book an Eat Mexico Tour? If you are traveling with a group of more than six people or with children, please send us an email through our Contact form listing your desired date, tour preference and special dietary needs. Once you agree to book the tour, we will send you the link to pay via our secure online system. We require payment in full in order to confirm your reservation. We do not accept cash payment for tours at this time. Street food and tacos are cheap in Mexico! Why do your prices start at $85 USD per person for two people? Each of our tours have been painstakingly designed to highlight not only the food, but each item’s importance in the city’s local culture. We do not design our routes based on coupons or kickbacks from our vendors. We tip our vendors generously and pay them for their time. We also keep our groups very small — our average tour size is three people — because we want our customers to get as close to the food as possible. Our guides also have a very specialized skill set. They’re bilingual and knowledgeable about Mexican cuisine, Mexico City history and the city’s informal economy, as well as being graduates of local cooking schools. On our tours they discuss topics ranging from the domestication of corn to local food politics. They also offer insight into the specific preparation and history of each food item we try. Eat Mexico pays its guides a wage that their expertise demands. 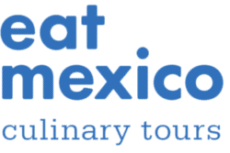 Lastly, when you contact us, you reach a real person who will not only book your tour, but also answer any questions about food or Mexico City in general. You’re paying for a level of customer service that we believe is unequaled in this market. Tips for each food vendor are included in the price. Tips for your guide, or for your driver if the tour includes private transport, are not included. If you enjoyed the tour, a cash tip to your guide and/or driver in Mexican pesos would be highly appreciated—the standard range in Mexico is 10 to 15 percent. How safe is Mexico City? Will I be safe on this tour? It’s a fact that drug violence has affected many, many areas of Mexico. Mexico City has fortunately remained relatively unscathed. We have never experienced any acts of violence on our tours, and we take travelers to neighborhoods where we’d be comfortable taking our relatives and our children. That said, property crime is part of city life. We strongly suggest travelers make themselves less of a target by dressing like the locals — no shorts, short skirts, sandals, flip-flops or tank tops. Women should wear something that covers their shoulders. Do not bring your passport, fancy camera or credit cards with you on the tour and do not carry anything of value in your pockets, particularly on the Merced Tour, when we ride the crowded subway and pick-pocketing can occur. Do your tours begin and end in the same place? No. Each of our tours has different meeting and end points. The end point will be in the same neighborhood, generally not too far of a walk (about 10 to 15 minutes) from where you began. The exception is the Merced Tour, which will require either taxi or subway transport back to main area of the Centro Histórico. (Seasoned travelers taking this tour may choose to walk.) For all of our tours, your guide will be happy to assist you in getting to your next destination once the tour is over. Just ask us if you have any questions or concerns! We did not design our tours with children in mind. That said, we welcome children — especially adventurous ones! — as long as the parents realize that the tour may not appeal directly to their sensibilities. Due to the pacing and length of our tours, we do not recommend our tours for children under 8 years old. One tour we do offer that children may like is Streets & Sweets, which loosely follows our market tour route, while adding in stops for churros, candy and sweet bread. If you are interested in this tour, please email us at hola@eatmexico.com with the number of children and adults, the children’s ages, and the desired tour date. How much do you charge for children on your tours? Infants or babies who can be held in a carrier are free. (We can’t accommodate strollers on most of our tours due to narrow aisles or extremely uneven sidewalks.) Families with children ages 2 to 7 will need to book a private tour at checkout, and kids in this age group are free with at least two paying adults. Children ages 8 to 13 can be accommodated on a regular tour that is open to the public. The price for children ages 8 to 13 is $35/ea. I’d like to book your tour for the same day I arrive. Can I do the tour if I come straight from the airport? We don’t recommend booking a tour for the same day you land in Mexico City or Puebla. First off, it’s a very long day: our tours involve a lot of walking across three to four hours and the altitude may be higher than you’re used to, making for an exhausting morning or afternoon. Second, many of our guests end up delayed at the airport — either because of a flight delay or they’re stuck waiting in line in immigration or customs. That said, if you’re in the taxi headed to your hotel and you’re eager to take a tour, call us at 877-887-0220. We may have something available. Our tours offer a look at what’s readily available on the streets. In Mexico City, this means different varieties of tacos, tlacoyos, quesadillas, tamales and freshly squeezed juices. The vast majority of our tours do not offer dessert, simply because 99 percent of the stands don’t offer it. The Mexico City stops will generally be a variation on a meat, cheese or vegetable filling, folded into fresh masa or a warm corn tortilla, and topped with lots of homemade salsa. Our stops in Puebla include tacos and different types of sandwiches, as bread is much more popular on the streets there. At some of the Mexico City stands we may try more regional variations of Mexican food, but a tortilla is almost always the vehicle with which to eat on the street. If you cannot tolerate rich or slightly spicy foods, you don’t like eating with your hands, or you’re searching for more composed plates such as enchiladas or soups, these may not be the tours for you. We conduct most of our tours Monday through Saturday, with one tour offered on Sundays (Journey through La Merced). We do not offer tours on Mexican holidays such as Semana Santa, Benito Juarez Day, Revolution Day and Independence Day, simply because most of our vendors are closed. We are also closed on Christmas Eve and Christmas day, and December 31 and January 1. Our tours are aimed at individuals, couples or small groups; they are designed to fit into your schedule. We will do our best to book the tour on your desired day. If the day is full or unavailable, we can work with you to choose a different day. Eat Mexico tour prices don’t include transportation. Two tours (Narvarte and Night and Taste of Puebla) offer private transportation services as an additional expense at checkout. On the remaining tours, you will receive a confirmation with our meeting point and you’re responsible for arriving to the prearranged meeting spot on your own, unless you have booked the transport add-on service. Most Mexico City hotels provide taxi services for guests and it’s generally easy and convenient to use them. Uber is another great option for transport in Mexico City. Once the tour is over, we will help you get an authorized, safe taxi to your hotel, or provide directions on public transportation. Each tour has its own specific meeting spot. After the tour payment is accepted, the customer will receive an automatic email confirmation with the meeting point, a maps link, and other helpful pre-tour information. Our tours are conducted in the Centro Histórico, Roma, Condesa and Cuauhtémoc neighborhoods. English is definitely spoken! Our guides are all Mexicans who speak fluent English. We will also happily do a tour in Spanish if you prefer. How soon must I book an Eat Mexico tour? We prefer at least one week’s notice, but we realize this isn’t always possible when you’re traveling. We’ll try to accommodate your request no matter what — however, if you’re requesting a tour for the next day, it’s best to call us at (877) 887-0220. Payment is due in full at the time of booking. Please read our Cancellation and Refund Policy here. We accept credit card payments via our online booking system. For further information, please visit our Terms & Conditions page. We do not accept cash payments for tours at this time. Can Eat Mexico tours accommodate vegetarians or vegans? Sure. We’ve had plenty of vegetarians take our Street Food and San Juan Market tours in Mexico City, as well as our Taste of Puebla tour. We can accommodate vegans as with a special customized itinerary. Our tours also work for anyone with cheese, nut and wheat allergies. Please let us what know your dietary restrictions in advance. To do so, you can contact us at hola@eatmexico.com or just fill out the contact page on our website. Payment should be made with a credit card, through our website. All of our culinary walks last between 3 and 4 hours. While we are not actively walking the entire time, you will be required to walk from stop to stop. There are between six and eight stops on each tour, so it’s best if you’re used to a moderate amount of physical activity. Many of the street stands we visit also do not have seating, so you will eat standing up. Unfortunately, at this time we cannot accommodate wheelchairs on our walking tours. The Mexico City sidewalks that we visit can be extremely narrow and crowded, and/or cracked and marked with open potholes. Our Puebla tour also features cobblestone streets, steps and a slightly steep grade. If you are wheelchair-bound and would like a culinary tour, please contact us about a custom offering. This is really up to you. We generally taste around six items on each tour, plus one or two beverages such as coffee or fresh juice or in some cases, a beer. Our tours include as much food as you can eat. However, since everyone’s appetite is different, it’s your responsibility to tell your guide if you’re full or still hungry. Is it true you’ll make me share my food with someone else on the tour? We designed our tours with hopes that everyone will be able to try everything, without ending the tour too full to walk. For that reason, our guides will offer a smaller suggested portion size (such as half a taco) at every stop. Please note this portion size isn’t mandatory—if you are hungry or you’re not a fan of sharing, you are welcome to your own item all for yourself! However, you should know that it is considered rude to waste food in Mexico. Nearly half of the country’s residents live in poverty. The majority of our vendors also hand-make the foods we eat and we see it as disrespectful to order something, take one bite, and throw it away. For these reasons, we try very hard not to waste the food we buy in the streets and the markets. Most of our tours run between 3 and 4 hours long. (For more details, please see the individual tour lengths located our Mexico City and Puebla tour pages.) We try hard to accommodate everyone’s needs, so occasionally this time varies slightly. If your group is especially inquisitive and has a lot of questions for the guide, the tour will most likely use the entire 4 hours if not a few minutes extra. If you are only one or two people and you tend to eat fast, the tour may end before the 4 hours are up. Please email us if you have specific concerns. Can I take photos on your tours? Most of the time—depending on the tour—yes, you may take photos. If you are taking a pictures of someone’s face, however, please ask your guide or the person in question for permission first. Not all the vendors on our tours like their pictures taken, and some stands vigorously object to any pictures being taken at all. It is also not considered safe or appropriate to take photos at certain parts of the Merced Market. We have been working with the same vendors for several years and we treat them like family. Please consult your guide at the beginning of your tour to find out which photos are okay to take. What does the price of each tour include? The price for our walking tours includes all the food you can eat, water, and usually one or two additional beverages such as coffee, juice or an agua fresca (fresh fruit cooler). The price of our Narvarte at Night Tour also includes all food, plus a private mezcal tasting and appetizer plate, a beer or cocktail at the cantina, and a microbrew at the end of the tour. I am a travel blogger. Can I take your tour for free, in exchange for writing about it? A short bio about you and your blog. Include how old your blog is and what kinds of topics you write about. Statistics. Your subscribers for RSS, social media; your monthly pageviews; your monthly unique visitors. Please share demographics about your readers, such as which age range they’re in and the gender breakdown of your readership. Previous work. List some collaboration you already had. You can also add testimonials from previous brands you’ve worked with. Include your blog’s logo and contact information so that we can easily reach out to you. If you have other specific concerns, please email us at hola@eatmexico.com.